Can't sit still a minute. I'm so, Oh, Johnny! Oh, Johnny! Now.. I was OK with this till I got to that part towards the end. This is the St. Crispian's day speech, just before the battle of Agincort, which is considered to be the greatest battle in English history. This speech is also where the "band of brothers" line originated from. If only Bush could be given "a muse of fire". You can read about St. Xenia by clicking here, and also here. Original Version of "O Happy Day"
DETROIT (AP) — Detroit is emerging as a national center for the rebirth of Orthodox Christian churches, which have deep ethnic roots in Eastern Europe, the Middle East and North Africa. Social scholars say the churches are growing in the United States through immigration and conversion. Next week, many of Detroit's Orthodox leaders will host the first in a series of conferences planned nationwide for non-Orthodox clergy who want to explore conversion. The Rev. John Fenton is betting his life on the growing popularity of Orthodox Christianity. He and his wife have packed up their six children from the rectory of a Detroit church where he was a Lutheran pastor until late October. They've moved into a small home in Allen Park, leaving behind Fenton's clergy salary and, soon, his health insurance. "My wife and I have spent a lot of time in prayer about this whole move, and it is difficult, but we do believe that God is leading us," Fenton told the Detroit Free Press. On Feb. 10 and Feb. 11 in Troy Fenton plans to join a small number of clergy nationwide choosing ordination as Orthodox priests. Fenton has lined up 16 former Lutherans as charter members of a new Orthodox parish he plans to open. Why the fresh interest? Fenton said many Christians feel battered by theological controversies in their own churches. In contrast, he said, Orthodoxy represents an oasis of Christian tradition with its centuries-old style of worship and timeless celebration of the mysterious power of saints. "So many people feel that the world is constantly changing all around them, and they want to find something that's so deeply rooted that it won't change on them," Fenton said. "I think that's the biggest thing that Orthodoxy brings to the American table." 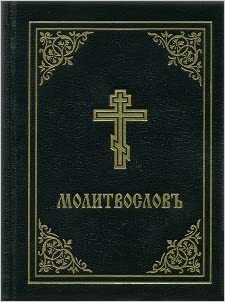 Since the mid-1990s, about 850,000 Americans have been drawn to more than a dozen different divisions of Orthodoxy that have congregations in the U.S.
Anastasia Titov's niece recently gave us some of Anastasia Titov's icons and books, and included among them was her Russian prayer book. I had seen her whip this prayer book out many times over the years so that the choir could sing some hymn that was needed, but until now I had never looked at it any more closely than to follow whatever hymn she happened to be pointing to. Her prayer book is a 1976 edition, Jordanville Prayer Book. The outer spine is now hanging by a thread. The pages of the first half of the Prayer Book (which contains the morning and evening prayers, selections from the Vigil, and the Divine Liturgy) are so worn that the pages are falling out. On the inside of the front cover, she hand wrote an index so that she could more easily find certain hymns or prayers... most of which are used during the services at one time or another. Throughout the Prayer Book you find hymns marked and slashed so that they could be sung more easily. At the back of the Prayer Book she pasted a typed and slashed text of the Kontakion of her patron saint, Great-Martyr Anastasia. Stuck into the middle of the Prayer Book are a photo of her beloved St. John of Shanghai, a Russian news clipping about the celebration of his feast day in San Francisco, a hand written page with the prokimenon and Alleluia verses of the New Martyrs of Russia, a copy of an obituary for her late husband Paul Titov, a clipped article in Russian that (as best as I can tell from my limited Russian) is about the making of the Sign of the Cross, and a photo of a plaque, which looks like it is on the wall of a Church, with the text of the "Our Father" in Slavonic. This Prayer Book is like a holy relic, and it has much to say about its former owner. Primarily, it tells me again what I already knew from 15 years of knowing her... which is that she was a woman of prayer, who had a deep love for God and a love for the services of the Church. Someday, someone will be cleaning out our books as well. We should ponder what they will say about us. Hopefully, the prayer books, Bibles, and writings of the Saints that we own will not tell everyone how much we neglected them. HUNTINGTON, W.Va. AP — Greg Mencotti worried he would never find a spiritual home. The Sunday school teacher grew up Roman Catholic, lost his faith and became an atheist. Eventually, he returned to Christianity, this time as a born-again Christian, spending years worshipping in a Methodist congregation. Still, he felt his search wasn't over. That led him to the Holy Spirit Antiochian Orthodox Church in Huntington, a denomination with Mideast roots that, like all Orthodox groups, traces its origins to the earliest days of Christianity. Today, Mencotti is one of about 250 million Orthodox believers worldwide — and among a significant number of newcomers attracted to this ancient way of worship. The trend is especially notable since so few in the United States know about the Orthodox churches here. "I was like most Americans," said Mencotti, who was urged by his wife to explore Orthodox worship. "I didn't understand anything about Orthodoxy." Orthodoxy was born from the Great Schism of 1054, when feuds over papal authority and differences in the liturgy split Christianity into Roman Catholic and Eastern Orthodox halves. In the United States, Orthodox Christians are a fraction of religious believers, numbering about 1.2 million, according to estimates by Orthodox researchers. In the past, their growth had been largely fueled by immigration, with churches forming mainly along ethnic lines. Some converts came to Orthodoxy through marriage to a church member. But now about one-third of all U.S. Orthodox priests are converts — and that number is likely to grow, according to Alexei D. Krindatch, research director at the Patriarch Athenagoras Orthodox Institute in Berkeley, Calif. A 2006 survey of the four Orthodox seminaries in the country found that about 43 percent of seminarians are converts, Krindatch said. There are no exact figures on the rate of conversion across the 22 separate U.S. Orthodox jurisdictions. But when Mencotti began attending Orthodox worship, the church was packed with converts, including the church's pastor, the Rev. John Dixon. The Rev. John Matusiak, pastor of St. Joseph Church in Wheaton, Ill., part of the Orthodox Church in America, said his parish has grown from 20 people in the early 1990s to more than 600 today, with the overwhelming majority of new members younger than 40. Krindatch's research found that one-third of the more than 200 U.S. parishes in the Antiochian Orthodox Church were founded after 1990. Matusiak said growth is especially apparent in suburbs and commuter towns. "People in Wheaton weren't flocking to Orthodoxy, because there was never a church here," Matusiak said. Many converts credit the beauty of the liturgy and the durability of the theology, which can be a comfort to those seeking shelter from divisive battles over biblical interpretation in other Christian traditions. Dixon, who was raised an Old Regular Baptist, an austere faith of the Southern Appalachians, said his conversion grew from his studies about the origins of Christianity as an undergraduate at Marshall University. The turning point came when he first attended services at an Orthodox church. "As soon as I came in that day," he says, "I knew I was home." Convert-fueled growth, though, has its challenges. Like converts in all faiths, the newly Orthodox bring a zeal that can be unsettling for those born into the church, who tend to be more easygoing in their religious observance. Parishes run the risk of dividing between new and lifelong parishioners, Krindatch says. "Converts to Orthodoxy form their own little quasi-seminary and it's almost a closed group," says the Rev. Joseph Huneycutt, associate pastor of St. George Antiochian Orthodox Church in Houston, who was raised Southern Baptist then became Orthodox. And some worry about converts' impact on the churches. They are entering the parishes at a time when many lay activists across Orthodox denominations are pushing church leaders to let go of ethnic divisions and pool resources so they can better evangelize in the United States. Huneycutt, author of "One Flew Over the Onion Dome," a book about conversion, and the editor of OrthoDixie, a blog about Orthodoxy in the South, said he was drawn to the faith by the beauty of its rituals and its teachings. On his first visit, he said the church was filled with the smell of incense and the sound of the chanted Divine Liturgy. The altar was largely concealed by the iconostasis, a large screen or wall hung with icons of Christ, Mary, angels and Apostles. And worshippers received Communion from a chalice and spoon. "I had become convinced that the Eucharist was the center of Christian worship — ancient Christian worship," Huneycutt says. "Once I had reached that point in my personal walk with Christ, there was no going back."